Alexanderplatz is one of the busiest thoroughfares in Berlin. 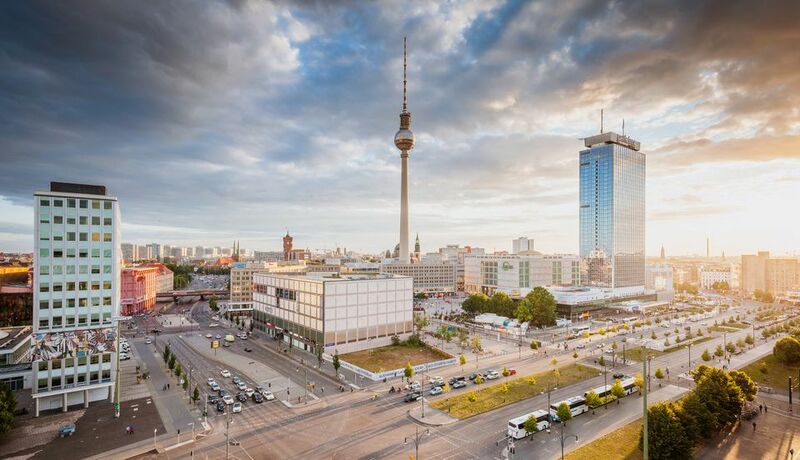 It's a transportation hub, a busy shopping zone, and an interesting mix of the city's past and present, from early Berlin to 1960s DDR (Deutsche Democratic Republic) to today's continuing development efforts. Known simply as Alex by locals, it is a massive public square in the center of the city in the Mitte neighborhood. While most of your time is spent racing through it, there is much to explore in this central square of the city. Once merely a cattle market in a developing Berlin, Alexanderplatz is one of the busiest squares in all of Berlin today. Prussian King Friedrich Wilhelm III ordered the market to be named in honor of the Russian Tsar Alexander I, who visited Berlin in 1805. It was located outside the city's fortifications, but the construction of Alexanderplatz Stadtbahn (the train station) and the Tietz department store in the early 1900s garnered it more attention and visitors. Along with nearby Potsdamer Platz, Alexanderplatz was the nightlife hub during the roaring 1920s. The 1929 novel Berlin Alexanderplatz (with subsequent films by Piel Jutzi's and Rainer Werner Fassbinder) documents that time period of the Weimar Republic in glorious detail. During World War II, Alexanderplatz's many underground lines became mass bunkers to protect people from the bombings. Tours explore these abandoned bunkers and cover this troubled time in history. In the 1960s, Alexanderplatz maintained its status as an important transportation center with trams and S-Bahn running ahead and U-Bahn below, while the square itself became a pedestrian zone. The construction of the Fernsehturm (TV Tower) in 1965 on the other side of the rails gave the city a pinpoint center. During its time as East Berlin, Alexanderplatz was aggressively modernized to represent the DDR's plans for a socialist capital city. The Brunnen der Völkerfreundschaft (Fountain of Friendship between Peoples) is an excellent example of this ethos in name and design. The sixteen ton Weltzeituhr (world clock) has become a meeting point in Alexanderplatz. All of this work made Alexanderplatz four times larger by the 1970s than at the end of World War II. Old buildings damaged during WWII were swept away, and sturdy concrete buildings were erected. Narrowly escaping the clean-up were Rotes Rathaus (town hall) and Marienkirche, Berlin’s oldest church. During the Peaceful Revolution of 1989, a demonstration in Alexanderplatz on November 4th was the largest demonstration in the history of East Germany. After the fall of the wall and the DDR, the square continued to evolve. Most importantly, this became the biggest underground railway station in Berlin. Large department stores and malls popped up around it, and it also became a major shopping destination. Sights to see: The Fernsehturm is the central focus in Berlin, as you can see it from almost every corner of the city from miles away. It dominates the Berlin skyline and towers over the square and railway station. Interested visitors can go up in the tower for panoramic views. Other developments from the 1960s that showcase the DDR aesthetic are the World Clock, Fountain of Friendship, and Haus des Lehrers (House of Teachers). Hold-outs in this bastion of 1960s architecture are Rotes Rathaus, Marienkirche, and the Nikolaiviertel (Nikolai Quarter). Just a five-minute walk from Alexanderplatz, this is the original site of Berlin from 1200. It was rebuilt for the city's 750th anniversary in 1987 and features a mix of historic houses, restaurants, and museums centered around Nikolaikirche (St. Nikolai Church). Events: Alexanderplatz is also the site of many of the city's festivals. While much of Berlin ignores the festivities down south, Oktoberfest celebrations are in full force here September through October. This is also one of the first locations to open for Christmas Markets which continue all the way to Neptunbrunnen (Neptune Fountain) in front of Rotes Rathaus. It's also not uncommon to see markets pop-up for Easter and a variety of other holidays. Shopping: There are few things you can't find at Alexanderplatz. Large shopping centers like Alexa and Galerie Kaufhaus are perched around the square, with international shopping brands like TK Maxx and Primark's flagship Berlin stores off the square. The large Saturn store can satisfy all your electric needs. Food: If you need a bite to eat, you are also in luck. This is one of the few areas of the city sausage vendors walk around selling bratwurst. It is the cheapest meal available by far, plus super satisfying with a hot wurst hanging out both sides of your brötchen (roll) dripping with senf (mustard) and/or ketchup. Nearby Hofbräu Berlin offers Bavarian hospitality (and another option for Oktoberfest in the north). Dolores on neighboring Rosa-Luxemburg-Straße is one of the oldest Mexican fast food locations in Berlin with its beloved Mission-style options. It is bordered by several other fast casual options like Spreegold, a chain of healthy, casual cafes. For a big, meaty meal, Block House is the place for steaks. The obvious choice if you want to stay in the central location is Berlin's Park Inn Hotel. Located right on the square, this four-star hotel offers premium amenities and extras like the occasional bungee jumper outside the window. If your budget is a lower, one80degrees is a good, close option. Alexanderplatz is one of the best connected locations in the city. Its train station caters to international and regional rail travel, as well as the S-Bahn lines including S3, S5, S7, and S9. At ground level, trams glide right through the square, so pay attention and listen for the bell when walking around. There isn't much parking nearby, but there are many roads that lead to Alexanderplatz with a few parking garage options. Down below, the U-Bahn (metro) in an interconnecting web of lines and exits to the surface. Lines U2, U5 and U8 meet here. The BVG offers an invaluable route planner to help you figure out routes and transport times.